Stress Free Zero Anti Gravity Home Massage Chair Recliner with Heat - Stress-Free Anti-Gravity Chair for Total Relaxation. Stress Free Zero Anti Gravity Home Massage Chair Recliner with Heat (AG-2001)- Stress-Free Anti-Gravity Chair for Total Relaxation. This Anti-Gravity chair brings together design and engineering to give you the most affordable stress-free recliner on the market today. Stress-free recliners have been proven to relieve back pain and muscle tension. They also increase circulation and help to reduce pressure on the spine and heart. These physician-recommended recliners offer a full range of positions for reading, watching television or taking a nap in complete relaxation. 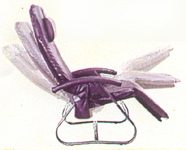 Adjustable Stress-Free Position: This Anti-Gravity Chair utilizes the same physician-recommended position NASA astronauts use during lift-off for unparalleled relaxation. When the lower legs are positioned above the heart, pressure on the spine is reduced, muscle tension is relieved, and circulation is increased. The Anti-Gravity Chair also features the added benefit of a customized massage with optional heat to soothe and stimulate the entire body. Two year manufacturer warranty. 10 Powerful motors target massage relief to the shoulders, back, buttoncks, thighs and calves. 6 Custom massage styles: cycle, oscillating, tapping and back, seat or body therapy. Personalized zone selection allows you to turn individual body zones on or off to suit your needs. 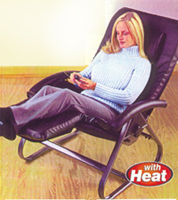 Soothing heat function penetrates to ease stiffness in your lower back. Adjustable footrest LED-illuminated hand control. Built-in locking mechanism for multiple-position use. 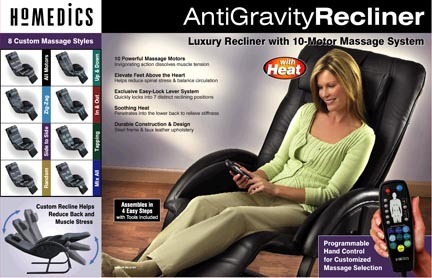 Stress Free Zero Anti Gravity Home Massage Chair Recliner with Heat (AG-2101) - Newer version of the Stress Free Zero Gravity Massage Chair. Includes more custom massage styles and a new lever control lock to lock the chair into 7 distinct positions. Two year manufacturer's limited warranty against defects. Weight should not exceed 270 lbs. Dimensions (approx. ): Seat Back is 35". Inside seat width is 22". Inside seat length is 18". Leg rest is 16" long. Seat height from floor is 16". 10 Powerful motors target massage relief to the shoulders, back, buttocks, thighs and calves. 8 Custom massage styles: cycle, oscillating, tapping and back, seat or body therapy. 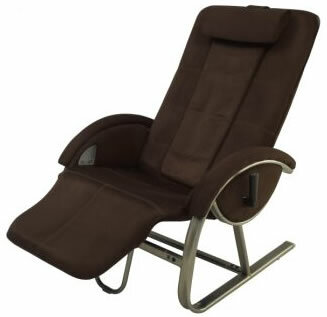 SHIATSU ANTI GRAVITY MASSAGE CHAIR RECLINER - Features a MOVING Shiatsu massage mechanism. Not just vibration. Plush Microsuede Upholstery. 7 different positions, including the de-stressing antigravity �V� position used by NASA astronauts during liftoff This position is often recommended for taking pressure off the spine. Antigravity chair brings together design and engineering to give you the most affordable stress-free recliner on the market today. They also increase circulation and help to reduce pressure on the spine and heart. 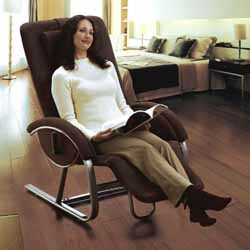 This is a more advanced, luxury version of the original Homedics massage recliner like the AG-2101 above. It has a more streamlined look and is more generous in Size: 60"L x 34"W x 43"H. Assembles in four easy steps. Supports up to 300 lbs. 2-year factory warranty.